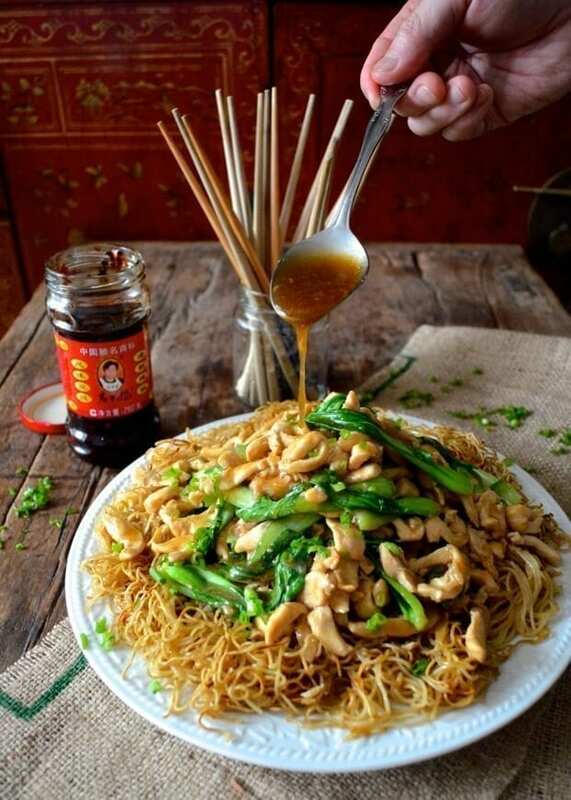 If you frequent any good dim sum restaurants, you’re probably familiar with this chicken pan-fried noodles dish, called “Gai See Chow Mein” in Cantonese. 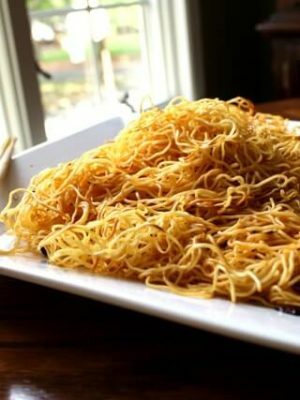 We always order Gai See Chow Mein when I meet my sisters and all of our kids for Sunday Dim sum. But we only order it after we’ve gone through all the har gow (shrimp dumplings), chive dumplings, crispy taro puffs, sesame balls, steamed ribs, chicken feet, porridge, sticky rice, tripe stew, stuffed tofu, turnip cakes, fried squid, and eggplant. 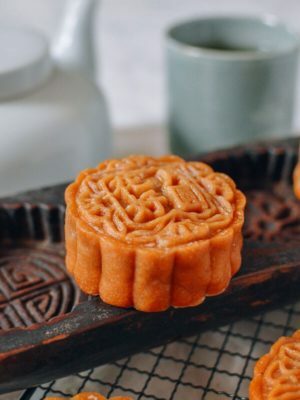 In other words…after we’ve taken down almost every selection of small dim sum dishes from each and every cart in the place, we’ll order a few noodle dishes for…dessert? Uh, we’re usually a pretty big table. Lots of kids. 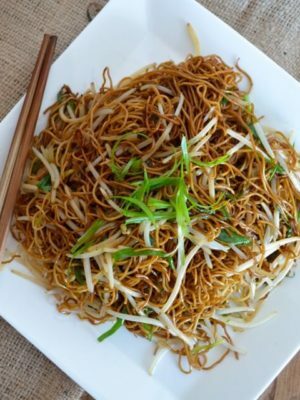 We’ll order Soy Sauce Pan Fried Noodles, chicken pan-fried noodles Gai See Chow Mein, and one other dish that we haven’t yet covered on this blog (I’ll leave you in suspense for now. We’ll post it soon). 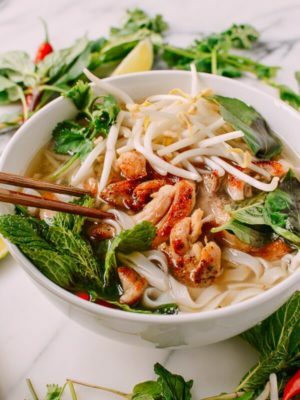 This particular noodle dish involves pan-fried Hong Kong style egg noodles, a velvety sauce, plenty of chicken, and leafy greens. 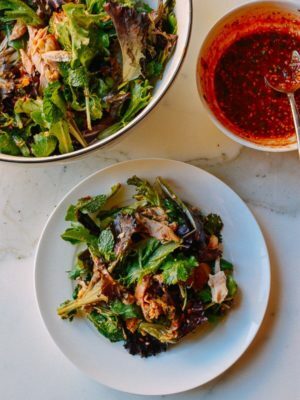 It’s pretty easy to make, so definitely give it a try—especially if you don’t have ready access to the restaurant version. 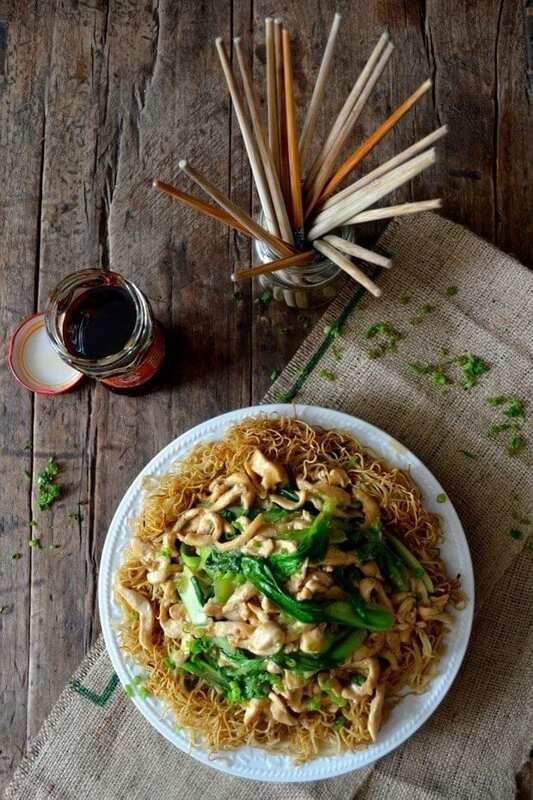 Here’s our chicken pan fried noodles recipe, folks! 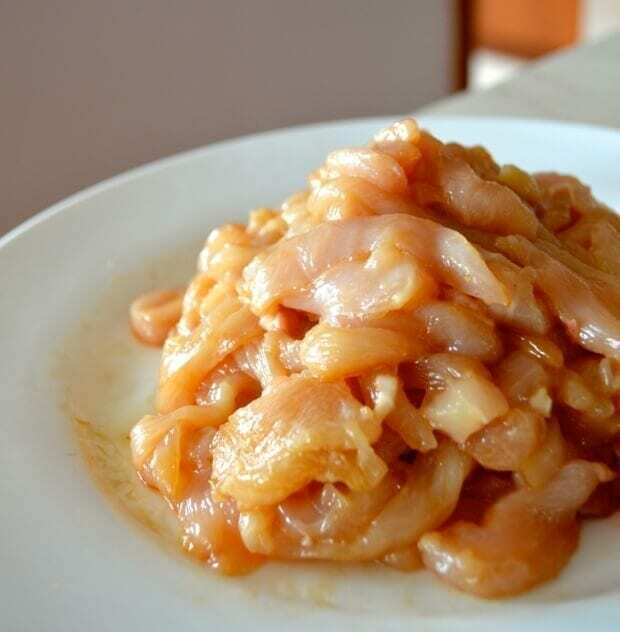 In a bowl, combine the marinade ingredients with your sliced chicken and set aside. Use your hands to tear the green vegetables lengthwise into manageable pieces and set aside. Bring a large pot of water to a boil. 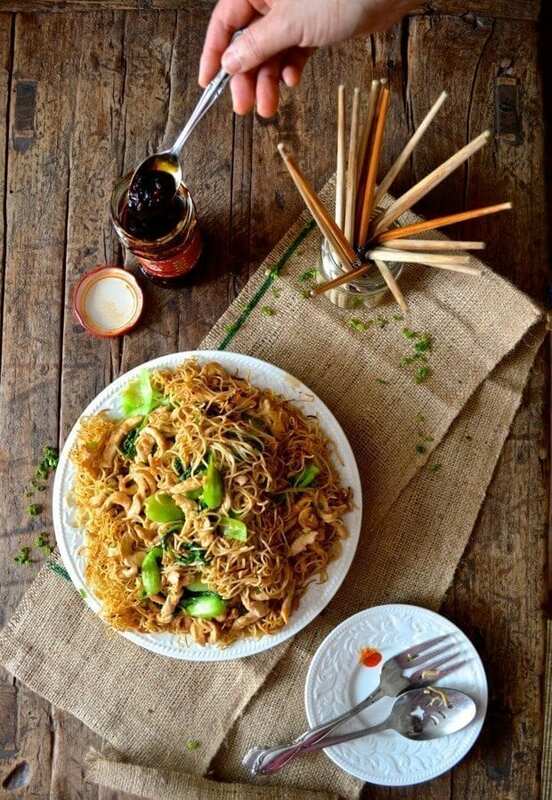 Add the fresh or dried noodles. 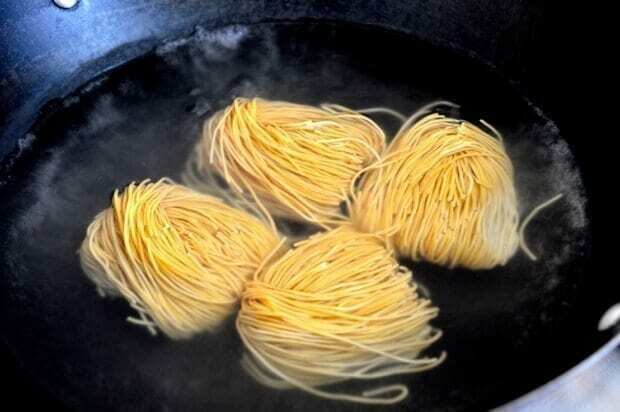 For fresh noodles, boil for 30 seconds to a minute. For dried, it’ll take a little longer. Cook until they’re just softened. 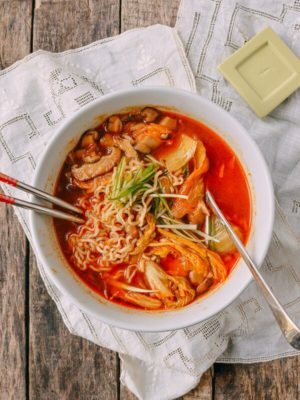 Read more about these and other essential noodles in our Chinese Noodles and Wrappers page! Be careful not to overcook them, or they’ll be soggy! Rinse with cold water, drain, and set aside. 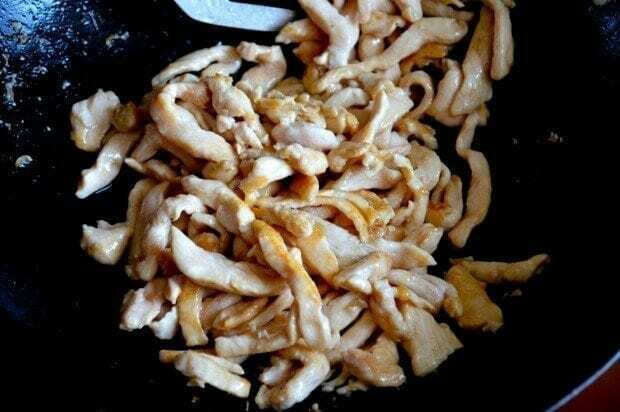 In a small bowl, combine the oyster sauce, soy sauce, sesame oil, sugar, salt, white pepper, and hot chicken stock. In another bowl, mix the 2 tablespoons of cornstarch and 2 tablespoons water into a slurry and set aside. 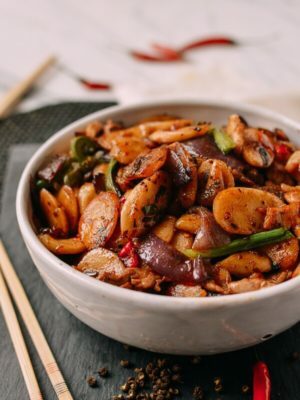 To go over what you’ve prepared so far: the marinated chicken, the washed and trimmed veggies, the cooked noodles, the sauce mix, and the cornstarch slurry. I know it seems like a lot of prep, but the dish really does come together quickly! Next, heat the wok until just smoking and add another tablespoon of oil. Sear the chicken breast. Once browned, add the garlic and then the shaoxing wine to deglaze the your wok. 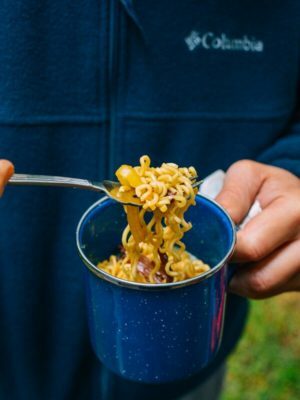 Pour in your sauce. Now you get why I said hot chicken stock, since I doubt you have a 50 thousand BTU roaring flame beneath your wok! Our dinky little Beijing flame isn’t the best either. Let the liquid come to a boil and add your green vegetables. Stir and cook for about a minute. 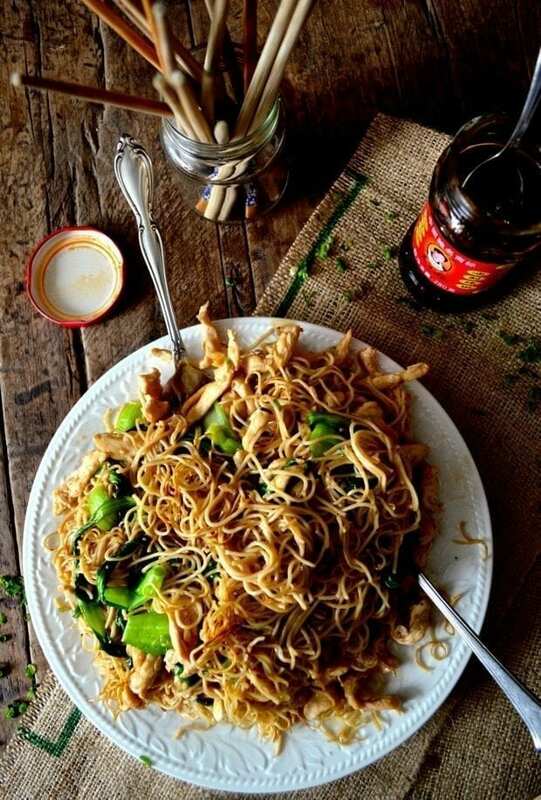 Pour the entire mixture over the noodles and serve your chicken pan-fried noodles immediately. 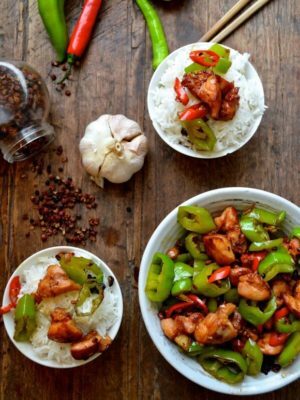 Serve with hot chili oil or Sriracha on the side if you like! That jar of sauce in the pictures is Lao Gan Ma or what we call “lady sauce” named after the nice lady pictured on the jar. 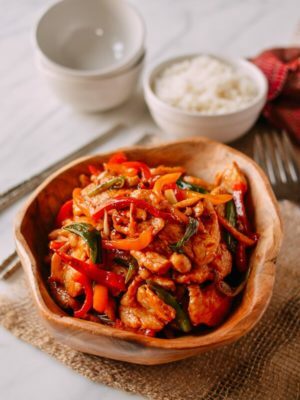 It’s a hot chili fermented bean sauce of Hunan origins and is darn good! 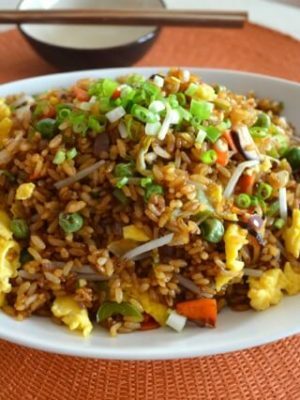 Read more about it and other sauces on our Chinese Sauces and oils page! 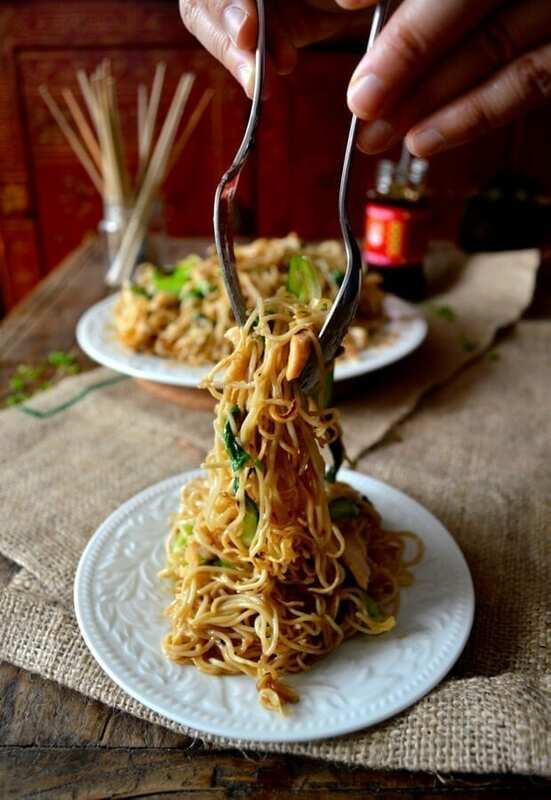 Chicken Pan-Fried Noodles (Gai See Chow Mein) is one of our favorite dim sum noodle dishes.Crispy pan fried noodles with a brown chicken sauce is the best! Bring a large pot of water to a boil. 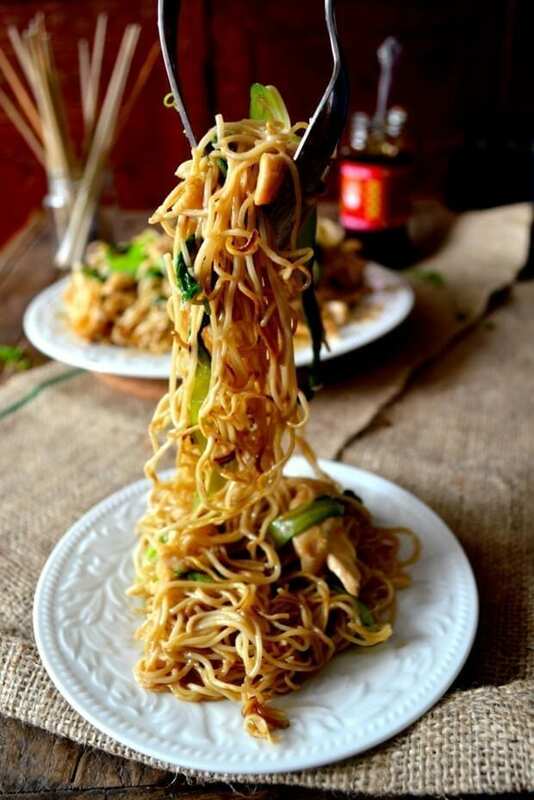 Add the fresh or dried noodles. 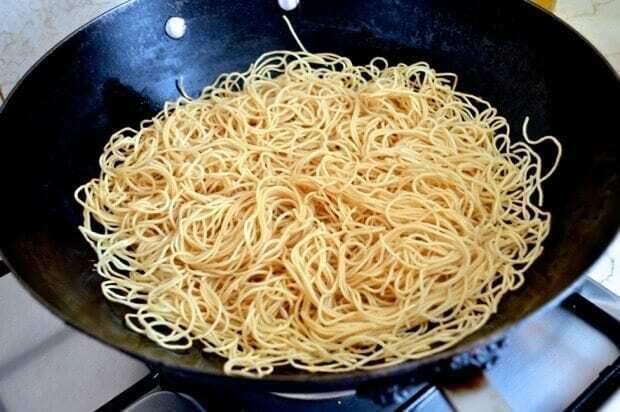 For fresh noodles, boil for 30 seconds to a minute. For dried, it’ll take a little longer. Cook until they’re just softened. Be careful not to overcook them, or they’ll be soggy! Rinse with cold water, drain, and set aside. Next, heat the wok until just smoking and add another tablespoon of oil. Sear the chicken breast. Once browned, add the garlic and then the shaoxing wine to deglaze the pan. Pour in your sauce. Now you get why I said hot chicken stock, since I doubt you have a 50 thousand BTU roaring flame beneath your wok! Our dinky little Beijing flame isn’t the best either. Let the liquid come to a boil and add your green vegetables. Stir and cook for about a minute. Stir up your slurry mixture again, since the cornstarch probably settled to the bottom of the bowl. Once the liquid is boiling, add about ⅔ of the cornstarch and stir the mixture to thicken. Add more slurry until the sauce thickens enough to coat a spoon. How thick you like your sauce it is also about personal preference. Allow to bubble up for another 30 seconds or so. 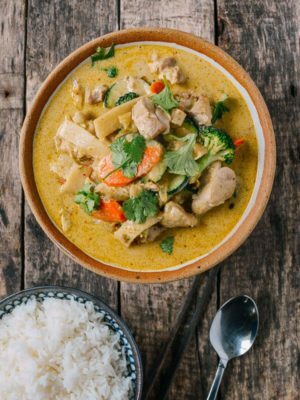 This is delish and so easy to make. I no longer have to order in when I have a craving, I can make it myself!!!! I also love that I can change the veggie around based on what I have on hand. This is a gold star dish! Thanks Kelly, small customizations to your own preferences and ingredient availability is what makes home cooking great!